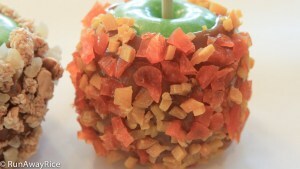 This is a fun twist on the traditional caramel apple. In this recipe, I am using dried Asian fruits instead of the typical candy and cookie toppings. These delicious apples are a healthier version and the kiddies and grown-ups will love them. How about bringing these delicious treats to your next Halloween party? Tilting the bowl helps to pool the caramel and makes coating the apple easier. If you find the caramel on the apple hardening and the toppings are not sticking, microwave the entire apple for 15-30 seconds and then apply the toppings again. If the caramel hardens as you are making the apples, just put bowl back in the microwave for another 45 seconds. Enjoy while fresh. Any uneaten apples should be covered and stored at room temperature for up to 4 days. If you enjoyed this recipe, you may also like: Peanut Candy (Keo Dau Phong) and Candied Orange Peels (Mut Vo Cam). Remove stems and wash apples. (If apples are waxed, quickly dip each apple in a bowl of hot water. Then wash with cool water.) Dry the apples and refrigerate for 1 hour. Insert a disposable chopstick down the center along the core of each apple. Put fruit bits into individual plates. Lay a piece of wax paper or parchment paper over a cutting board or large plate. Place the caramels in a glass bowl. Microwave on high for 2 minutes. Stir. Microwave on high for another 1 minute. Caramel should be completely melted and smooth. 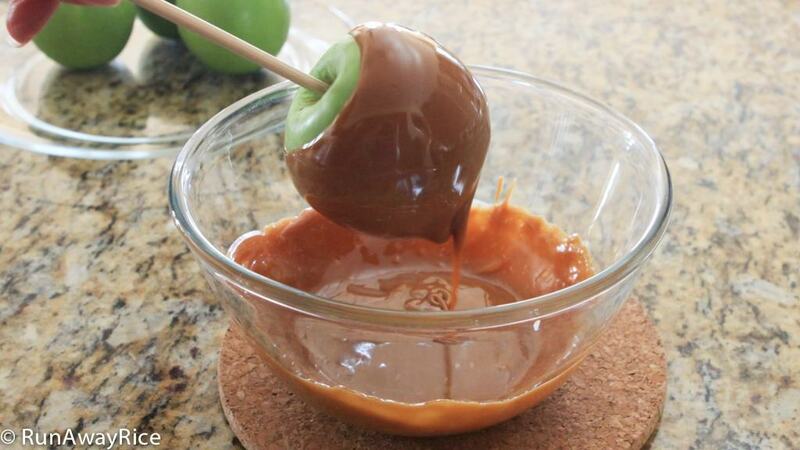 Holding the chopstick end, dip apple into the melted caramel. Quickly swirl apple making sure it is evenly coated. Remove apple from caramel and allow the excess to drip off. Quickly roll apple in dried fruit bits. If fruit doesn’t stick, use your hands to press the dried fruit onto the apple. Remember to work quickly. Place apple on wax paper and allow 20 minutes to set. These apples are best if eaten within the day.